By now most readers of this blog know that the Bulls have a new manager, Jared Sandberg. Sandberg may be young, just 36, but he’s been playing or coaching in professional baseball since he was 18 years old, and for parts of 5 of those years he was one of the stalwarts of the Durham Bulls. A few years back we dove into Bulls history and came up with a “greatest hitters” list of 17 Bulls. Jared Sandberg’s on that list as #6 by one sort and #12 on another sort. So, we fans are getting a guy who’s played a lot of baseball in the International League and understands some of the special dynamics of Triple A baseball. Sandberg’s major league stats are here and minor league stats are here. But the press releases are pointing out his success at several levels in the Rays system, and that’s probably what should be important to us. What now? As we’ll get to later, probably next month, the Durham Bulls manager and most (all?) of his coaching staff participate in spring training as part of the big league training camp. 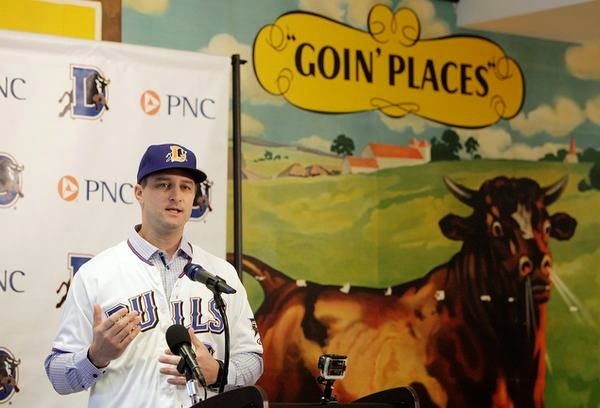 Consequently, we are unlikely to hear much more about or from the Bulls new manager until the team shows up in Durham in early April, if then. For that matter, we will not know the composition of the Bulls roster until the Rays break from spring training. That said, we were impressed with his comments and what he had to say. He seems comfortable with the press and he has obviously given a lot of thought to his new job. Do we have anyone out there who remembers Sandberg as a player? About 18 minutes into the Bulls YouTube video, Sandberg mentions that he has chatted with both Steven Vogt and Craig Albernaz since his selection. That’s interesting. Also, Craig Albernaz is back in the Rays system as a coach for the Princeton Rays. Could not be happier for him. Nice to know that he’s back. Bet he’ll have fun down at spring training this year, this time not in catcher’s gear. I should remember him as we were fans back then. One of my FB friends who used to be very into the Bulls back then (and has since moved out of the area) certainly does remember him. But, honestly, I can't really recall much about him. There are some players who really stood out in my mind during that time frame, but he's not one. That said, I think it's a good hire and a good setup. Rays certainly seem to try to be going young on their managers and coaches. I assume the idea is to have people they can groom up the system for years to come. I agree about the good hire. There really does seem to be strategic thinking afoot in Rays system. Plus Sandberg and Cash will be spending a lot of time together this spring. Look forward to him being here. Interesting comment. Wish Sobsey was reporting for local paper these days.